It's another Saturday (well actually it is the middle of the week since I write these in advance; you don't really think I wake up early enough in the morning to publish these entries at 6:00 am every day, do you?) and that means I just ramble around with whatever comes to mind. 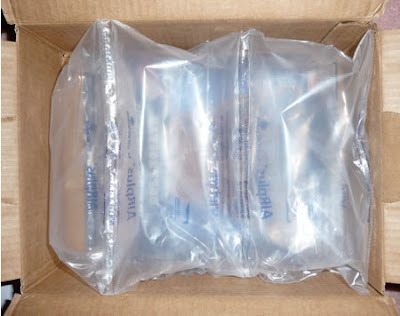 Sort of like those boxes with question marks plastered all over the side that they used to advertise in comic books that offered $50 worth of mystery treasures for only $1 plus shipping and handling. Speaking of which, have you ever sent for anything advertised in a comic book? I did. Once. A humongous number of revolutionary war soldiers plus artillery - something like 500 or 1,000 pieces being offered for a pittance. Half were blue, half were red, I bugged and bugged my mom until finally she gave in and sent a few bucks so I could have this massive recreation of our fight for independence. Then the big day came. A box came in the mail. It was about the size of a box of checks (do you still use those?). I stared at it. This must be just part of the order. The rest must have gotten delayed. I opened the box and..
And it was the entire order. I never saw army soldiers so small and flat. I'm not sure but I think I had to twist them off the plastic frames they were molded on. These wimpy things wouldn't even stand up straight; they were so thin they fell over on their side. It wouldn't matter if I could stand them up anyway, they were so small, it was too awkward to handle them. "You wanted them, you play with them," my mom told me. I did make a good faith effort but I couldn't bring myself to play more than a couple of minutes before discouragement overwhelmed me. I couldn't believe there were people out there who would publish such a misleading advertisement! Like I said, this is rambling Saturday because I didn't even think about those soldiers until I wrote the first paragraph about the box with the "???" on it. 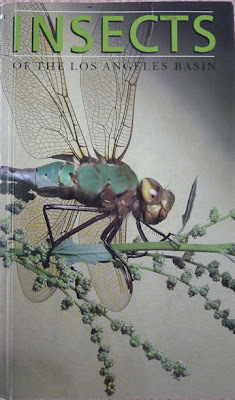 A few days ago I mentioned how I used to collect insects and loved to read about them. I was telling my friend Hiroshi about this and he mentioned this book. I had actually seen it long ago at the Los Angeles Natural History Museum but didn't buy it at the time (and regretted not doing so). He said it was out of print but they had used copies on Amazon.com and he sent me the link to the page. Sellers were charging outrageous prices for this book but I did find one that was reasonable so I ordered it. And it came in the mail and I looked in it and saw a whole bunch of familiar faces! Well, maybe not faces, but pictures. You're smirking, I know, but it was interesting to me. 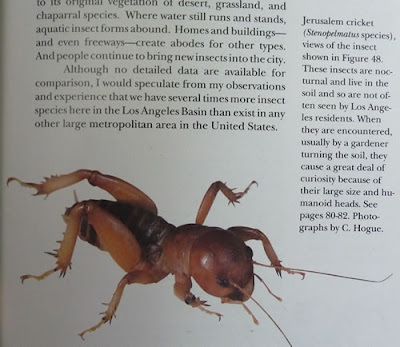 Below is one of the pictures from the book, what I think is the absolute ugliest insect bar none. Ever seen these around? Makes me shudder just to think of them - it's even worse than Whoopi Goldberg and Sandra Oh combined. The formal name is Jerusalem Cricket, although I always called them Potato Bugs and someone else told me she used to call them Baby Faces. Baby faces? A face only a mother could love, I guess. Here's something else that came this week from Amazon. First take a look at the box, with lots of air bubble padding. What could be in there? 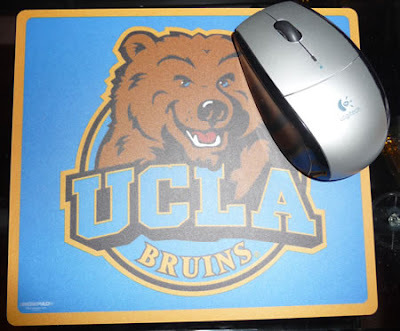 This is what it is: a UCLA mouse pad! 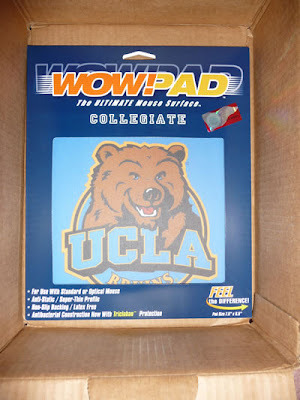 Or rather, WowPad, which is a very thin textured plastic pad that works a lot better than a regular mouse pad. I was thinking, they waste a whole box for this? It isn't even 1/32" thick and it cost $4.99 so it must have cost them more to ship it than the profit they made on it. Then what did they do in the past? Send me Seven Samurai in an envelope which had a cracked jewel case so I had to return it for another one. Go figure. Now changing subjects completely, the other thing I thought I'd write about is all this social networking stuff going on. Do you belong to any of them? I've got a Twitter account, a Facebook account, and a MySpace account but I don't use any of them. They're all pretty much dormant; they haven't been visited since I originally filled in the blanks when I signed up. I did twit for a bit but haven't in a long time. I just don't see the point. Am I getting old? Or do I just not get it? Do I want to type "right now I am eating bacon" or, "I've discovered traffic is not pleasant" so people can update themselves about me? Or I can read the same things about other people? I've never been much of a socializer anyway and I shy away from crowds whether they be in person or cyberspace. It just gets to be too time consuming keeping up with all that stuff. Ah, but what is he doing writing this blog? You might well ask. I dunno.. it's just uh, different. It's not the same thing. I just like to write on a plain and simple page and not have some site that has too many things going on at once, like videos or music files that start playing as soon as you get on the page, or pictures of 329 friends in the right column or favorite this or that in boxes spread all over the place. Or writing or having people write Me MEsSaGEs LIke ThIs tHAt nO ONe CaN REaD. So that's my ramble for this Saturday. Here's a couple of rambling, wandering videos to go along with it. Looking at that second video - next year will mark 40 years since man first set foot on the moon. Think about it- that is one fantastic accomplishment. We take so much technology for granted today but consider what the world was like back then (if you were even born yet). It shows what great things can be accomplished if you set your mind to it.